The British Library once again opened its doors for Africa Writes, this weekend 29 June to July 1st. 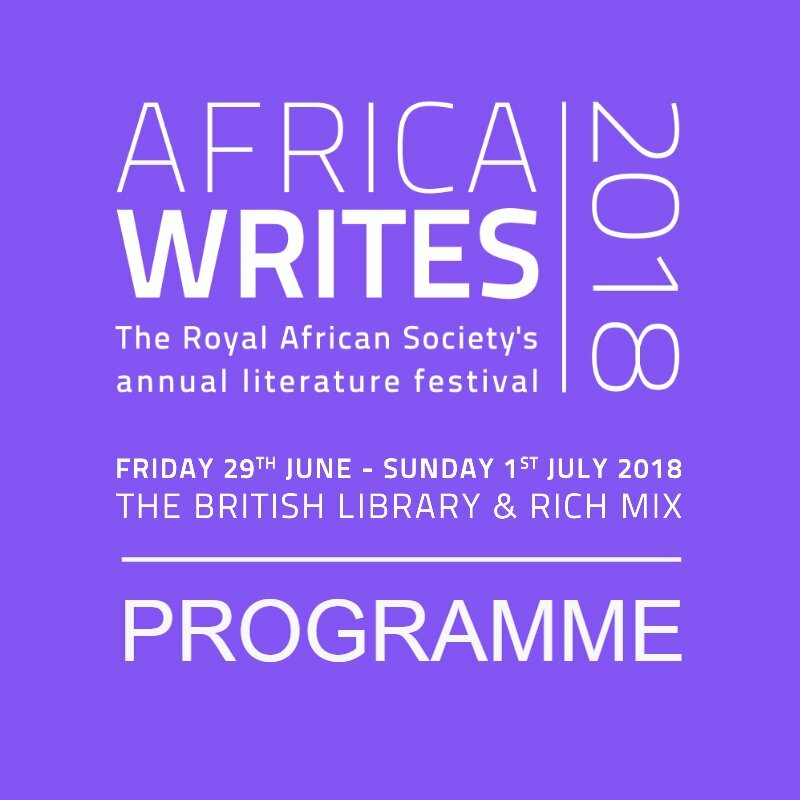 One of the most awaited events on the London literary calendar: launched in 2012 the Africa Writes festival is an annual celebration of contemporary literature from Africa and the diaspora curated by The Royal African Society. The 2018 event focused on womxn and saw the launch of 5 new novels and a Wakanda-themed festival party hosted by Octavia Poetry Collective at the Rich Mix on Sunday night. The incredible and palpable energy, the vibrant atmosphere and the talented guests wove an interactive and enriching dialogue both with the audience, sellers and publishers, with a keen eye on education, politics and media. While the Friday evening opening event was entirely dedicated to performance, with Yomi Ṣode’s intense one man show COAT, this years headline kicked off with Africa Writes Young Voices Showcase, a necessary space for young voices to thrive and grow, award-winning podcast Mostly Lit in conversation with journalist and writer Afua Hirsh about her recently published book Brit(ish): On Race, Identity & Belonging (Penguin, 2018), and the symposium Why African Literature Matters, where professors, activists and educators discussed the place of African literature in the British curriculum and shared good practice and ideas to develop a more inclusive and diverse program in the years to come. The day moved through with Ayesha Harruna Attah’s book launch The Hundred Wells of Salaga, an insightful and delicate book about women’s lives in 19th century Ghana, Hanna Ali’s The Story of Us, an inter-generational conversation about contemporary Somali literature, Akwaeke Emezi’s astounding debut novel Freshwater, which explored the metaphysics of identity and being, and Leila Abuela’s last magnificent work Elsewhere, where the author explores intimate stories of longing and exile. The exciting program included intriguing discussions on African Literary Figures in Georgian & Edwardian London, which encouraged a more inclusive and realistic picture of African people in Britain and their contribution to arts and culture, and Cameroonian Literature 101, which explored the rich and burgeoning literary scene of the country, from Mongo Mbeti to Imbolo Mbue and more. The day ended with Hargeysa International Book Fair Pop-Up and a roundtable conversation with the talented writers shortlisted for the prestigious 2018 Caine Prize, included in this year anthology Redemption Song and Other Stories. The final day, Sunday program continued the delivery of thrilling sessions about literature, politics and activism, both with New Writing from Uganda and The Making and Re-making of Zimbabwe and continued with an intimate conversation about gender and race, exploring narratives by queer womxn across Africa and the diaspora, and creating space for them to share their stories, while Chiké Frankie Edozien’s memoir Lives of Great Men, on the other end, offered a highly personal series of contemporary snapshots of same gender loving Africans. The role of small magazines and podcasts in the literary world is a crucial topic that touches many issues such as representation, safe spaces and diversity in the mainstream, and this year Africa Writes explored both in Small Magazines, Literary Networks & Self-Fashioning in Africa and the Diaspora the conversation was a lesson on how African Literary print and online publications thrive and survive, how they grow their audiences and they sustain themselves and how they remain relevant. The powerhouse panel was made up of Christopher Ouma, Kate Wallis, Madhu Krishnan, Nancy Adimora, Dzekashu MacViban and Jama Musse Jama. Books in Your Ears: On Literary Podcasts offered interesting workshops on Afrofuturism in Art, Literature and Fashion, and Family Storytelling and an Africa in Translation Masterclass, with unmissable round-tables chaired by savvy literary editors, sellers and professionals in the industry. With its keen eye on emerging talents and all the different aspects of writing and publishing, by exploring different perspectives, experiences and voices in the contemporary African and Diaspora literary world, Africa Writes brings to London a range of authors, professionals and works, encouraging conversations around the richness of African cultures and experiences and the importance of creating and nurturing platforms that allow those voices and experiences to be heard and cherished. This year our new arts paper Alt A Review was a media partner which falls under our remit to champion events that champion diversity and celebrate the creativity of diaspora voices.